Media Credit: Public health school dean Lynn Goldman speaks with philanthropist and financier Mike Milken at an alumni event in New York, N.Y. last October. 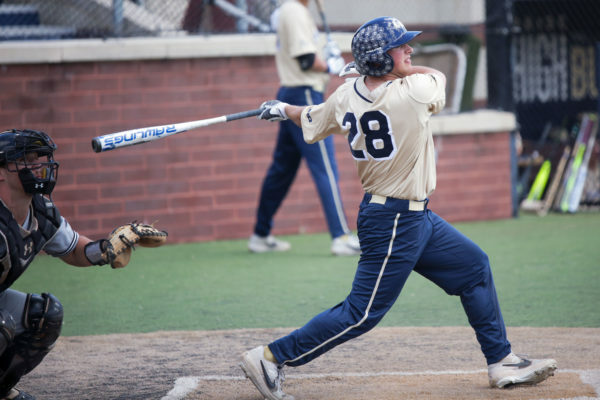 Photo Courtesy of GW Media Relations. Public health school dean Lynn Goldman speaks with philanthropist and financier Mike Milken at an alumni event in New York, N.Y. last October. When billionaire business titan Michael Milken came to campus three years ago with dreams of growing a massive public health hub in his name, University President Steven Knapp was taken by surprise. It was the first time the pair had met, and Milken was not an alumnus, a trustee or a previous donor to GW. But Milken had done his homework and came into meetings knowing the University’s history as well as the entire educational background of Knapp and the public health school dean Lynn Goldman before pitching his big plans. 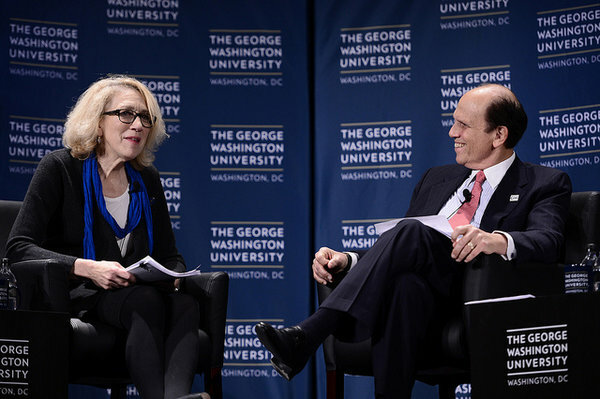 As the conversation progressed, Knapp said it immediately made “perfect sense” that Milken chose to give his mega gift to GW because of the public health school’s proximity to the country’s biggest decision makers. University President Steven Knapp said Tuesday that the gift to GW made sense because of the public health school’s proximity to policymakers. “They were looking for a place where they could have the greatest impact,” Knapp said in a phone interview from Los Angeles on Tuesday. Donations announced late Monday night from Milken and media mogul Sumner Redstone totaled $80 million and represented GW’s two largest-ever gifts. The University sealed the gifts at a crucial time, just the way it’s drawn up in fundraisers’ playbooks: a slow courtship that aligned donors’ interests with GW’s priorities. Over the last three years, Milken has met with Knapp, Goldman and other officials at dinners in the University’s elegant City View room on E Street, at conferences in Los Angeles, Atlanta and D.C., and at the 650-person alumni event in downtown Manhattan that centered on healthy living last October. “The country’s commitment to the biosciences brought people to Washington to change the world. And now it’s time to focus that commitment on GW,” Milken told the crowd of alumni, faculty and deans packed into Park Avenue’s Waldorf Astoria last fall. During that same three-year timeframe, Goldman has hired more than 40 professors, poured resources into research and steered the creation of a $75 million building that she has described as “a revolution” for the school. Now the school has secured transformative donations that are, altogether, more than five times the size of its $14 million endowment. Top administrators broke ground on the new public health building in 2012. Half of the $80 million will come from the Milken Institute, the former Wall Street executive’s economic think tank, which is now the namesake of the public health school. The Milken Family Foundation also donated $10 million to endow the dean’s position and multiple scholarships. Those philanthropy efforts are a big part of Milken’s decades-long revival. The 67-year-old pled guilty to felony charges of security fraud and conspiracy two decades ago, and served 22 months in prison after being sentenced to 10 years. He was diagnosed with prostate cancer less than a week out of prison, and has since focused his life on medical and public health research – dubbed the “the man who changed medicine” by Fortune magazine. Since then, Milken has partnered with Redstone, the 90-year-old majority owner of Viacom who also survived prostate cancer, on numerous donations to fund prevention-based research. At the encouragement of the Milken Institute, Redstone’s charity gave another $30 million to create a global center for prevention and wellness, which will focus on the obesity epidemic that now affects one-third of Americans. Geoffrey Moore, a senior adviser to Milken, said leaders of Milken’s institute and his family’s foundation refocused their efforts in the mid-1990s to play a larger role in health care decisions. “The institute asked, ‘Where do we center our efforts?’ The more they looked at that, the more they realized it was all in Washington, and the one institute of public health in Washington was GW,” Moore said. He rattled off names like the American Heart Association, the U.S. Food and Drug Administration, the American Red Cross that are headquartered in D.C. – many located just blocks from GW’s campus. Goldman, now serving her fourth year as dean, said she hopes to hire the center’s director by this fall and announce its first round of grant opportunities over the next few months. 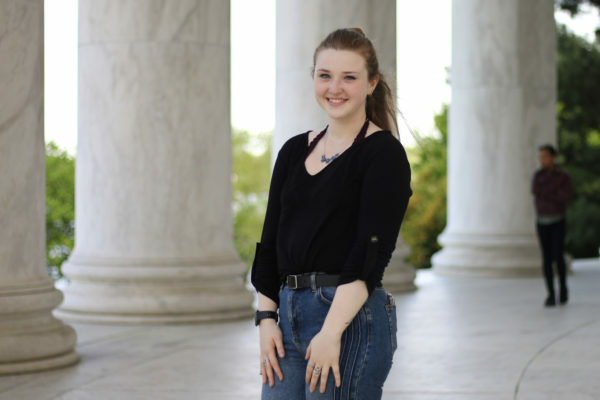 She also hopes to recruit students as the initial batch of Milken scholars and convene a meeting of top public health leaders on GW’s campus by the end of the year. “Our every intention is to move forward as quickly as possible. We want to show these philanthropists some return on their investment. We want to show them that they made a good choice,” Goldman said in a phone interview. She said the scholarships will dramatically improve the school’s recruitment, particularly among doctoral students who typically require well-funded fellowships in exchange for their extensive research. The three-part donation, which far surpasses the University’s previous record-breaking gift of $25 million in 2011, is also a needed boost for its fundraising office as it plans to launch the biggest campaign of its history. 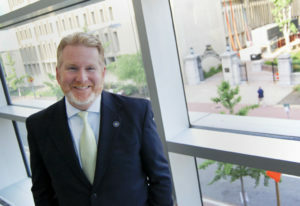 Vice President for Development and Alumni Relations Mike Morsberger said the collective $80 million gift is a “game-changer” as GW heads toward a massive fundraising campaign. He said GW would look to cash in on the attention from two of the world’s largest philanthropists by using it as leverage to reel in new donors and seal gifts that are still in the works. Before the Milken and Redstone gifts, GW had previously counted just 10 gifts exceeding $10 million in its 200-year history – a poor track record that put it out of the league of top research universities like Georgetown. In its largest fundraising year before this one, GW pulled in about $120 million. Increased fundraising is also key to wean the public health school – and the entire University – off heavy tuition dependence. The school’s $22 million in donations made up just 1.1 percent of its revenue last year, with almost all coming from research grants and tuition. The donation also reduces pressure for GW to pay off the $75 million public health school, which will require about $25 million fundraising and the rest coming from debt and government research subsidies. Donors had given only $3.5 million as of last month, reflecting a trend that’s been seen across the University and across the country. GW has also underperformed in its largest-ever construction project, raising less than $10 million for the $275 million Science and Engineering Hall. “We know today what donors are most interested in funding is not bricks and mortar. It’s programs that will have an impact,” Knapp said. As the 17-year-old school prepares for its major dive into prevention and wellness studies, Goldman said she will need to bring together strong researchers to lead the studies and the right mix of policymakers to have conversations about the results. The public health school pulled in a total of $38.6 million for research last fiscal year, up from around $15 million a decade ago.